The two small kittens who moved in to our house in September have become strident and essential. We could not live without them: each has their own place in the world. Millie the witches’ familiar has yet to find herself a suitable witch, and thus she stays with us, unsettling everyone with her strange detached killer’s calm and the face of a small kitty angel. Monty, the strong eyed siamese ginger tom, is a warm-hearted hothead who will brook no emotional rebuff, stalking fearlessly into the coldest English psyche to take residence there. He appears to love the rain and takes pleasure in charging out in thunderstorms and bringing in the rain with him, as he tramps up the northern face of the duvet to alert us of the excitement outside and deposit half of it on us. He is ruler, king of this tiny kingdom, Shrewsdania. After he and the dog got shut in a room together by mistake one day they reached an entente cordiale, and now are the best of mates. Monty spends his days hunting and meeting other cats and running in and out of the house to munch the odd biscuit. He lies on things in the sun and lounges. His favourite perch is unconventional. For Monty has taken to sleeping on the bird table: that hallowed sanctum of our feathered friends, where they are ostensibly are to dine on seedy fat bowls and bits of bacon rind. It towers above the garden, far above the four-legged masses. It is unassailable. Or so we thought. 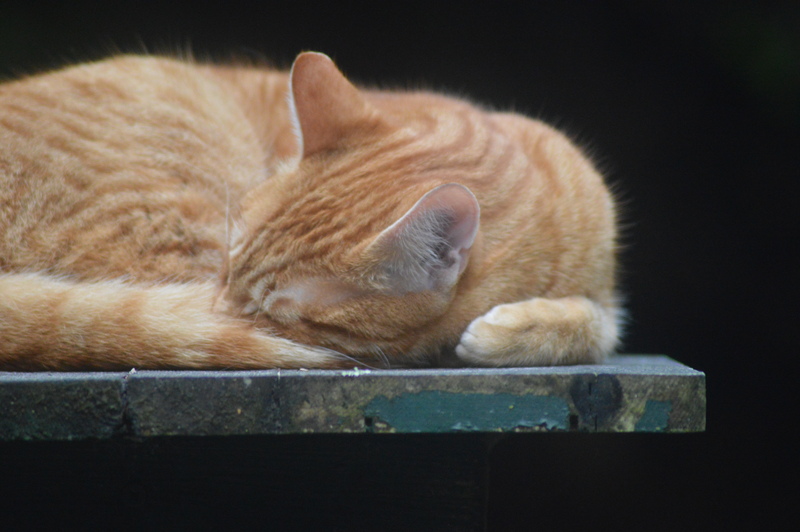 A couple of months ago, I came out to the kitchen and looked out in the garden to find a large ginger tom sitting on the bird table. The birds had, wisely, scarpered. We have never seen him get up there. Does he use crampons? We have no idea. We walk in and there like Yoda he sits, a fulcrum of space and time, at peace with the universe, aligned with his purpose in life, utterly, supremely content. He is a metaphor on a plinth. A symbol set high. Yes, he has nicked the birds’ café, but we can relocate that. He is proof that one needs little to make oneself very happy indeed. Monday cometh. Perhaps we all need to access our inner bird-table to face the week ahead. 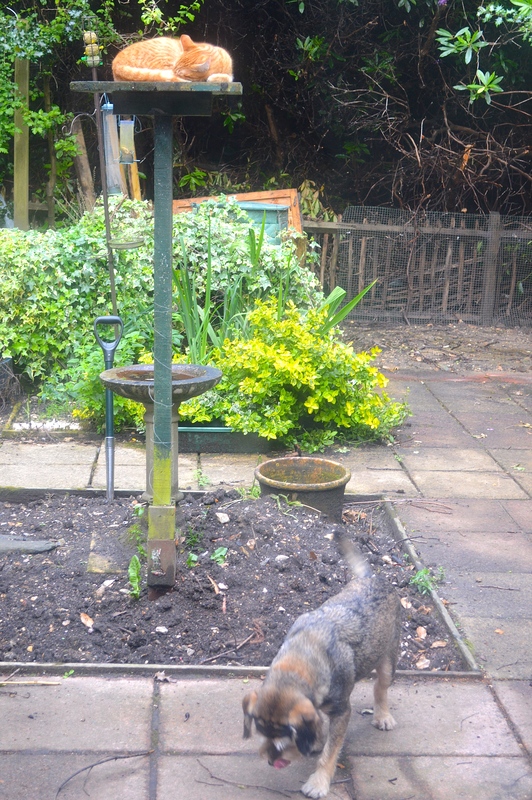 Posted in Shrewsday MansionsTagged bird table, cats, england, humour, petsBookmark the permalink. It is. Did you, Sidey? Our Stanley used to sleep in a shallow chamber pot on top of a spindly plant stand…never an accident – but we never saw him scaling it. Oh, for a picture, Helen. What a sight that must have been. Every cat should have a such a bird table for soaking up sun. Indeed. It should be thought: a cat table. What a great place to watch everything go by. Quite possible he may jump straight up – or leap from birdbath. Glad the pup and he have managed an agreement…RC cat and the Molly are closer, but still working out treaty. Oh, I’m glad things are moving forward positively. Friendship between cat and dog is generally a thing of excellence, isn’t it? Mac and Monty were initially most sceptical about each other. Clearly incarceration, albeit temporary, was just the ticket. That is going in to my personal lexicon – find my inner birdtable – live at peace. Like the photos too. Wonderful share, Kate. All the cats in the ‘hood must see Monty as King of the Hill. If they look up, Nancy 😀 I must do a stake out to see how the feline neighbours are taking it. I once had a cat (also part Siamese), who on one or two occasions managed, unseen and unassisted, to ascend to the top of a 6-foot+ curio cabinet. The next closest piece of furniture would have been more than a door-width’s leap away! We never figured it out. This appears a lovely spot to nap and observe his fiefdom. Karen, you made me chuckle 😀 Felix managed to snap Monty on top of the six-and-a-half-foot wardrobes in our room. How in Heavens’ name…..? It must be a Siamese thing. Hi Marc-André – thanks for coming along to read. Cats do cute very well. What a feat. He must expend so much energy getting up there. It’s no wonder he goes right to sleep. I can almost hear the Mission Impossible theme just thinking about it, Andra! Oh, Kate – what a puzzlement, and what a resourceful cat. You need one of the nanny cams to catch him in the act of pole topping. Must spend some time watching when the Summer hols arrive, Penny. Maybe one day I’ll get lucky and spot how he gets there. Does he accept ear scratches or does he defend his throne with tooth and claw? He is the epitome of largesse, Rafael 😀 He will accept any homage we care to offer. I love the idea of an inner bird-table. Me too. I want one. Now. What a lovely sleeping spot Monty, such a resourceful cat. Thank you for the Monday morning laugh! My pleasure, and thanks for coming along to read. He is resourceful; and persistent. I feel sure he has many more laughs in store for us in the months and years to come. Monty has found an ideal spot, even if it does take a little effort to get up there. Hopefully no birds expecting free food will approach the table when he is on it. No, Guy; you have a point. We ought to invest in some serious signage….though the birds round here have a fair amount of wary common sense. Pondering, how would I like my birdtable to be? That is the one I am going to occupy and perch on for the rest of summer? I definitely need one, thanks to Monty and his chronicler for the idea! Thanks, Martin – I must give it a try! Monty seems to be a little put off by having his slumber interrupted to become the subject of a blog post. 🙂 He may as for royalties (pun intended). Ha! He may indeed, Patrick.Come to think of it, I did get some censorious looks while the long lens was directed at him. Methinks a relocation of the birdbath might inspire him to seek another nest? I suspect he uses it as a springboard.